Ross's Law Marketing Blog: Smoothing a litigation firm’s sharp edges. Smoothing a litigation firm’s sharp edges. 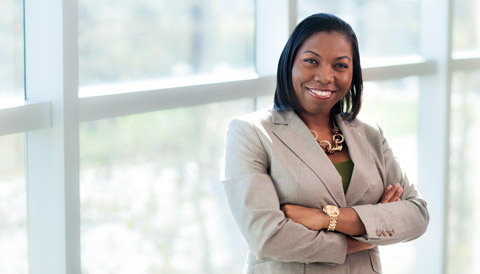 Hedrick Gardner is one of North Carolina’s top litigation firms — 100 lawyers with hard-core trial skills. They resolve their clients’ business, worker’s comp, and insurance matters efficiently, but are quite happy to pick a jury when the case or situation merits it. I love this firm and the campaign. 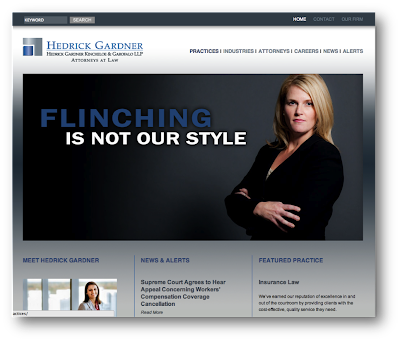 With art photography and in-your-face headlines, we show that the Hedrick Gardner lawyers are strong, tough, skilled, and confident. Marketing Communications Coordinator Alyson WIllis (a wedding photographer herself) and Marketing Event Coordinator Sara Snavely supervised the chosen photographer to ensure the lawyers’ expressions walked a fine line – powerful, but not jerks. Fearless, but not mean. Direct, but not harsh. This is important because we want to show prospects that they’re also friendly and approachable. That is, you sure don’t want to oppose them at trial, but you’d be happy to grab a beer with them after work. So, to reduce any possibility that the home page banners might convey to prospects that the lawyers are harsh, we asked them to smile in their biography photos, to show their genial personalities. You know, just in case. We think these materials are pretty powerful – dramatic and eye catching, but still appropriate for a law firm that had not done any previous marketing of this type. This is a pretty big first step.